Denver Bronco quarterback Tim Tebow’s openly religious behavior in the National Football League this season captured the attention of the nation. But this week Patriots’ chapel coordinator Don Davis is interested in getting the attention of his players the night before they face the New York Giants in Super Bowl XLVI on Feb. 5. Davis, 39, is responsible for organizing non-denominational chapel services and setting up speakers for home and away games. Though he currently lives in Leesburg, VA., he often speaks himself, as he will this weekend in Indianapolis. He also serves as the Director of NFL Programs for Pro Athlete Outreach and is the Regional Director of the National Football League Players Association. The optional chapel services, which are held for players the night before every home and away game and every Sunday morning for players’ families, typically last for 20 to 30 minutes. Davis said chapel topics vary on a needs basis, but that it’s common for speakers to select topics such as why players should strive to be the best they can be on—and off—the field, motivated by serving their team and God. Not a newcomer to the NFL, Davis spent eleven years a defensive player in the league, including four seasons with the Patriots that earned him two Super Bowl rings. 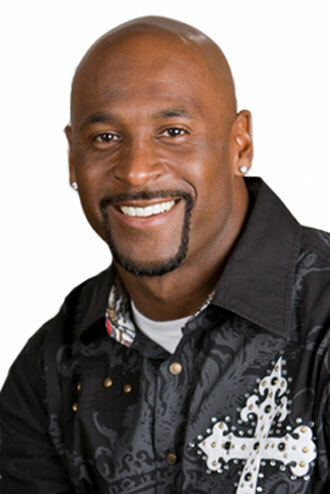 Davis led regular Bible study discussions for his teammates while with the Patriots from 2003-2006. After retiring in 2007, he was hired as the Patriots’ assistant strength training coach and team chaplain for the next season. He was the official chaplain of the team from 2007-2009, a position that no longer exists within the organization. Davis also refers players to Paul Friesen, 61, of Bedford, Mass., who leads a weekly couples Bible study with his wife Virginia for Patriots’ players and their wives. The couple has led the study for twelve years. Friesen said the group meets every Thursday nigh during the season at different locations including homes, churches or Gillette Stadium for a meal and a discussion around particular passages of scripture. Friesen said that the number of players and their wives in the group varies from season to season, but this season there are six couples who consistently attend. Though the couples study didn’t meet this last week, Friesen said he and his wife have been sending emails of encouragement to the players as they prepare for the Super Bowl game. The Patriots last appearance in the Super Bowl was in 2008 when the team suffered a 17-14 loss to the New York Giants, and Davis said he knows the Patriots players are prepared for the game. “When you’re a player all the X’s and O’s are done by Thursday,” he said. That’s why he hopes to inspire team members this Saturday night with a talk that goes beyond football. Davis said that on average 15 to 20 players attend chapel services, though he anticipates attendance could be higher for this week’s pre-game gathering. The chapel service will take place at the Patriots’ team hotel in Indianapolis the night before the game. Davis, who was in Hawaii at the Pro Bowl this past week, will be in the stands watching Super Bowl XLVI. When asked if he’ll have access to Patriots’ locker room after the game for what he hopes will be a celebration, he laughed. We are providing you the best most affordable Umrah program for our Islamic siblings. You should not fear about anything relevant to the Hajj packages. Your all problems are ours. We are providing you our group to the visitors of Allah concerning to their reservations more affordable and within your indicates as coordinate up to the opponents to get the highest possible business. Our objective is only to provide the visitors of Allah Almighty. Watch T20 World Cup 2016 live streaming on PTV Sports, Star Sports and Willow TV. The big event that is scheduled to be started on 8th March, 2016. No repairing service would work unless they have a skillful workforce who is well trained in their job, because repairing and maintenance is all dependent on how well the individuals perform their task. Credible repairing services, in Manchester specifically, make sure that their workers have full knowledge off all that they will be dealing with. Due to this very reason home appliances repairing in the Manchester UK has already briefed their workers on popular washing machines like LG and Bosch, so that when they are called for their repairing, they are well prepared. Davis has shared a very interesting and inspiring post. I appreciate Davis for taking the responsibility of organizing non-denominational chapel services and setting up speakers for home and away games. This was quite inspiring and interesting. Any student in need of SPSS Statistical Analysis help- Analyzing quantitative Data, can always liaise with us for the most professional help. The Hajj is a yearly Islamic pilgrimage to Makkah, Saudi Arabia and Pilgrims perform this Divine Worship with great spirit. Islamic Travel offers the Cheap Hajj Packages for UK Muslims. You can latest information regarding and download pdf official available MDU Result 2019 & get other imp details. Visit us at Islamic Travel UK site, and benefit a Cheap Hajj and Ramadan Umrah Packages 2019 for your sacrosanct excursion. Hi, thanks for sharing! Hương Lâm là đơn vị cung cấp may photocopy và dịch vụ cho thuê máy photocopy uy tín với dòng máy photocopy ricoh và dòng máy photocopy toshiba giá rẻ. فمع مؤسسة نقل اثاث من المملكة السعودية الي الاردن عليك أن تتأكد أننا سوف ننجز لك كل الخدمات التي ترغب في أن تحصل عليها في فترة وجيزة بشكل كبير و قياسي على الإطلاق ، حيث أننا سيكون لدينا أيدي عاملة فريدة و خبرات عظيمة لنقل الأثاث ، ايضاً سوف نسعي إلي القيام بنقل الأثاث في اي وقت جائز مع الجودة و الجدارة العالية بشكل كبير ، فاحرصوا بحيث يكون لكم نصيب عظيم من التداول مع افضل مؤسسة نقل اثاث من المملكة السعودية الي الاردن و تحصلون على خدمات هامة للغاية في نقل الأثاث و الاثاث في اي وقت جائز . Sturgis Bike Rally is just around the corner.